The camera mounted on the back of the Xiaomi Mi Pad 7.9 is capable of capturing 8MP (3264 x 2448) stills and 1080p videos. True to its Apple-inspired ways, the Mi Pad 7.9 is very scarce on options giving you only a virtual shutter and camcorder buttons with no additional settings for resolution or quality. There's not even a panorama or HDR mode present on the Mi Pad 7.9 but seeing as how you're mostly going to use the slate as an indoor pet, we can't say we're surprised. Xiaomi has loaded the Mi Pad 7.9's camera with a lot of shooting effects like Sepia or Black and white. The viewfinder shows you how the effect would look in real time. As for quality, the Xiaomi Mi Pad 7.9 is not that bad as you would suppose bearing in mind it's a tablet, and not a cameraphone. There's plenty of detail to go around and we like the dynamic range and colors. Things are mostly sharp in the center but our unit exhibited some odd blurring here and there in some images. There is also a lot of noise present in the photos even in good light - especially in solid colors (like the blue in the sky or the yellow in the building below). Macro samples came out good. The Mi Pad 7.9 was fast to focus and snapped images with good close-up detail and a slight separation of the subject and the background. Overall, when push comes to shove, the Mi Pad 7.9 will be even able to fill in for a cameraphone with barely any compromises. 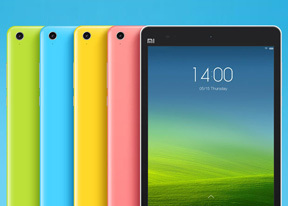 The Xiaomi Mi Pad 7.9 churns out 1080p videos at 30fps. They carry a lowly bitrate of around 14Mbps and a very low 96Kbps audio bitrate, very low 16kHz sampling rate with mono sound. All adding up to very low numbers and in turn just "okay" quality. Videos have a good amount of detail and run smooth but noise is still very much present and there are artefacts here and there during playback. The sound in the videos isn't impressive as well. Here's a 1080p@30 fps video sample (25.4MB, 0.14s).